Baldessarini has launched Ambré Oud, a new fragrance for men. Ambré Oud is a flanker to 2007's Ambré. The authority, strength and stylish confidence of an experienced man of the world. These attributes are embodied in Baldessarini Ambré Oud. The masculine-mystical composition combines elegant and bitter-smoky notes. Elements that serve as a symbol of the fragrance concept also form part of the composition: Inspired by the warm colours of whisky, the top note carries the aroma of an oak whisky barrel combined with fresh, red apples. The heart note is dominated by oud, in association with noble leather tones and the Baldessarini signature note of patchouli. The base note gets its sensual elegance from amber and smoky labdanum. Additional notes include mandarin, violets and oak. 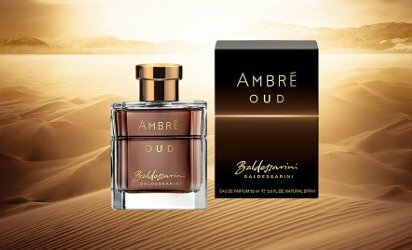 Baldessarini Ambré Oud is available in 90 ml Eau de Parfum. The poster child for being late the to party? No kidding! But they won’t be last in the door, I’m sure. Am I supposed to have those characteristics already or is this fragrance my route to them? I think you have to buy Ambre Oud. Or I guess if you were that man you’d have already bought it?